CLANSMAN at the Oban terminal. After two and a half decades of regular traveling to Europe’s ferry hotspots, Scotland was still an almost uncharted territory for me. At least until this summer, where I had the chance to combine an invitation to attend a friend’s wedding party on Arran with a three nights stay in Oban. That offered a central starting point for me for an introduction to Western Scotland and the complex network of the ferries from Caledonian MacBrayne, hopefully to be followed by several more journeys in the years to come in the vast areas both south and north of Oban and the Inner Hebrides. Three nights equals only two whole days and with the unpredictable summer weather, I had been warned about, it was with some worry I arrived at my guesthouse in the early evening after a picturesque three and a half hour train journey up from Glasgow. I told the landlady about the reason for my stay and ask her about the following days weather in Oban. “Interesting question, indeed. I will tell you tomorrow,” she answered and convinced me that I should have the black pudding for breakfast – an ecologically locale produce from a farm shop nearby. The next morning I had a stroke of luck, with a crystal clear blue sky, far better than BBC Scotland forecasted on my smart phone the night before. And after a “full English” with the promised black pudding, which was really lovely, I could take my first photos of the day right out of my window: ISLE OF MULL’s 07:45 departure for Craignure. On a new territory and with very little location research done in advance, other than a lot of printed out CALMAC-timetables, I just improvised the best I could by the suns shifting direction until mid-afternoon. At that point, the BBC Scotland weather office had foreseen a shift to all grey, which this time was right in the bulls eye, unfortunately! But considered the odds I was satisfied with the result of that busy first half of the day, and could then sign off and leave my heavy camera back at the guesthouse in order to pretend to be an ordinary tourist visiting charming Oban. As a maritime photographer, great light sometime stress me a bit when travelling, if I also has to take part in other activities at an interesting seaside location. The shots from those hectic hours were only to be followed by a few others during my Oban visit. Mostly from the morning of the third day from my walk to the train station. The whole second day I followed a suggestion from a very well-travelled Danish ship friend, who had recommended me to go on the CLANSMAN on her weekly sailing from Oban to Coll, Tiree and then all the way out to the Outer Hebrides (the island of Barra) and all the way back again. A journey that start out of Oban at 07:15 and ends there again at 21:30. The second day’s weather was a bit of a challenge; more or less with constant light rain, thick grey sky and low visibility. So I decided not to do much photography that day. Instead I just went into my “long distance ferry journey mode”. The most relaxing state, no cruise ships, I have ever been on, have ever been even close to offer. 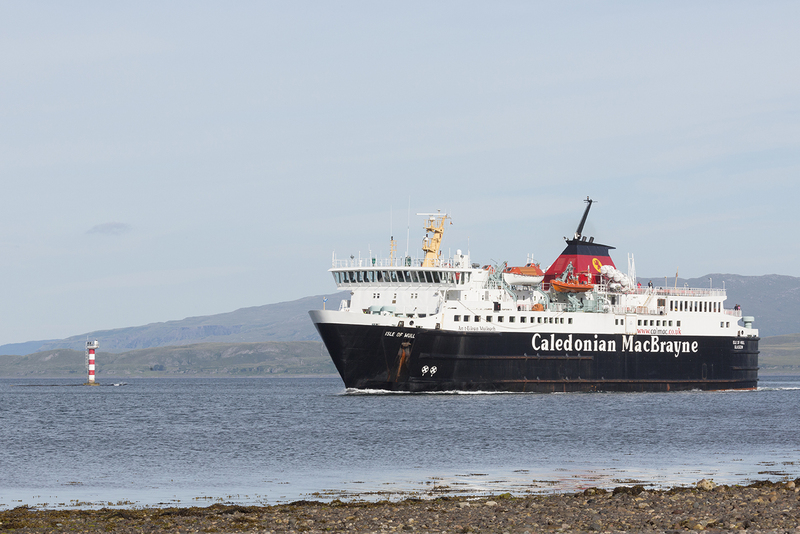 That whole day on CLANSMAN now figures on my top five-list of long-distance ship journeys. There’s nothing like a real working ship fulfilling transport needs for cargo, locals and travellers. No cruise ship or cruise ferry can in my opinion never compete with that in terms of travelling experience. In a retro perspective view I should have done a photo story from my 14 hours on-board that fine working-horse with its friendly crew and nice diverse collection of passengers, which change every time we visited one of the small remote harbours, but I didn’t. The long distance ferry journey mode, I was in, just didn’t allow!